A full meeting of the International Executive Committee of the Committee for a Workers International was held in Belgium from 6 - 11 December. This extremely successful meeting was attended by 65 members from CWI sections in Asia, Latin America, Africa, USA, Europe. This meeting reflected a significant advance in the strength and influence of many CWI affiliated parties and organisations. The first session of this meeting unanimously adopted the resolution below, following discussion and amendments being agreed by the meeting. The resolution was proposed by the International Secretariat as a basis for the first discussion. This session covered developments in the World Economy, USA, China, Europe and Iraq. Others sessions dealt with the class struggle in Asia, especially Pakistan, Sri Lanka, India and Malaysia; Latin America; Africa prospects for the building of new Workers’ Parties and the work and struggles of the sections of the CWI. Reports of these discussions will be published as soon as possible. This current phase of capitalist globalisation has some similarities, but at the same time is different, to the ‘globalisation’ – although not known by this term at that stage – of the late nineteenth and early twentieth centuries, which crashed in the catastrophe of the First World War. That period was marked by export of capital to ‘colonies’, which became protected markets, as well as sources of cheap raw materials. This resulted in a constant jockeying and conflicts between the different imperialist powers. This struggle could ultimately only be settled by war. There are, of course, many features of that period in the present situation: a ferocious struggle between the imperialist powers for resources, particularly oil, an economic competition for advantage and superiority, accompanied by military conflicts and interventions, such as the Iraq War. This is manifested above all in the developing conflict between the US and China, which will come to dominate world developments in the next period. While the threat of a major inter-imperialist armed conflict is not posed in the short to medium term there is the very real threat of major trade wars developing between the imperialist blocks. This stage of capitalist globalisation differs, in some respects from the pre-First World War period. Then, capitalism exported capital to its colonial possessions as a means of extracting cheap raw materials and selling back dearer manufactured goods, consequently receiving, as Marx put it, “more labour for less labour”. This unequal terms of trade still exists and, in fact, has got worse for the neo-colonial world. In the last few decades, however, foreign direct investment (FDI) has been concentrated in the ‘triad’ of Europe, the US and Japan. This has now been somewhat modified by the colossal export of capital to China – which is now almost on a par with the US as a recipient of FDI – and, to some extent, Eastern Europe and the former USSR, as capitalism seeks to relocate its productive potential in order to exploit raw materials and the pool of cheap but educated labour provided by the collapse of Stalinism. Between 1990 and 2003, FDI soared and the ratio of the stock of FDI to global product grew from 9% to 23%. This, together with other factors, such as the so-called information and communications revolution, has meant a colossal integration of the world economy, which in turn means, as Marx predicted, that events in the national arena will be increasingly shaped by processes on a world scale. The neo-colonial world is integrated into this system but is still mainly a source of cheap primary products. The rise of China, however, could threaten the long term the hegemony of the triad and particularly the US, economically as well as militarily. This assumes that China can continue uninterruptedly on the present growth rate which is not at all certain. There is the threat of a world recession or slump which can have a profound effect in China. There is also the inevitable resistance of the Chinese working class to the inhuman conditions in the factories, low wages, pollution etc. A rise in wages as a consequence of mass struggle could result in a relocation of investment from China to other lower wage countries and regions which could affect growth. At present the US and thereby the world economy currently hinges on China and to some extent Asian capitalism as a whole. An astonishing unwritten Faustian pact exists between these ‘partners’. The US has its largest current account deficit ever which, the International Monetary Fund estimates will reach $760 billion or 6.1% of US gross domestic product (GDP) in 2005, although recent forecasts suggest a slightly lower figure of $706 billion. The result of all this is what the capitalist economists call unsustainable ‘imbalances’. This means the Asian economies, led by China, have seen their foreign exchange reserves grow from 36% of the global total excluding the US to 60% today. China’s reserves have exploded, accounting for two thirds of the reserves of Asia as a whole. These reserves are overwhelmingly US dollar assets accumulated by most Asian central banks at the expense of investment in Asian domestic industries. Asia led by China underwrites the US economy and plugs the gaping holes in the US deficits. At the same time, the market for government debt, involving the buying of US Treasury bonds, is still buoyant because the capitalists, flush with record profits, are pouring in their cash into these rather than into productive investment. All of this has helped to fuel a rise in consumer spending and a decline in savings leading to “their increasingly unsustainable US housing boom [Financial Times]. As we and the more serious capitalist commentators have pointed out, this financial house of cards could collapse at any moment: “Imbalances [are] near the tipping point.” (Ibid). Charles Dumas of Lombard Street Research warned “The whole economy is running on capital gains... [If] house prices stop rising, the US economy’s going to have problems.” The exchange rate of the dollar could collapse at any time, leaving Asian central banks facing huge capital losses on their dollar holdings. For this reason, they could be tempted to ‘disinvest’ themselves of dollars for other currencies which, in turn, could be the trigger for the collapse in the dollar. How long can the boom last? This is a question not just preoccupying us or the working class movement but the soothsayers of capitalism themselves. It has lasted this long only because world capitalism, led by the US, has been on a spending binge, fuelled by the ‘quasi-Keynesian’ measures for the rich e.g. mass tax cuts for the most wealthy. A regime of historically low interest rates exists, derisively called ‘free money’ by some bourgeois economists, and massive unsustainable deficits. A crash is certain, although the ‘how’, the ‘when’ and the scale remain uncertain. However, such is the underlying fragility of the world economy that the skids could be under the world capitalist economy in the coming months. On the other hand, the elastic could be stretched a bit more to a breaking point which could sustain the present economic cycle for another year or so. But, as the Washington-based Institute for International Economics has forecast, the balances are going to widen until markets get nervous about them, bond yields start to rise, and at that point governments start to get nervous. “Bigger adjustments are more painful. People want to ignore that and operate on the economics of wishful thinking.” (Financial Times). Therefore, this present phase could come to a shuddering halt, plunging stagnant Europe into an even greater economic and political whirlpool, aggravating an already serious crisis for the Bush regime, and even stalling China’s seemingly unstoppable turbocharged growth. In the medium and long terms the economic prospects for China and its effect on world capitalism are central. It has already had an effect in sustaining the present ‘boom’ beyond its limits in conjunction with the ‘super liquidity’ in the world economy. Can it provide a more stable platform for a further, longer growth phase for world capitalism? The bourgeois economists fervently hope so. They claim that the collapse of the ‘planned economies’, by which they mean Stalinism, in Eastern Europe and the former Soviet Union and the move towards capitalism in China has doubled the world labour force but the same capital stock remains. The seemingly endless supply of cheap labour, they hope, can fuel a ‘rebirth’ of their system. Such a hope is problematical to say the least. While investment in China or Eastern Europe has given and will give a certain boost to capitalism, it has mainly increased the ‘supply side’, the productive forces. Yet this is against the background of a growing overcapacity, particularly in manufacturing industry, autos, etc. Moreover, the market demand, particularly in China and in Eastern Europe and Russia, outside of a few urban centres is limited due to the low living standards and impoverishment of the masses. But, if against the odds capitalism is able to so economically exploit China, Eastern Europe, thereby extending its life cycle, this would not be the end of the matter. First, there are the environmental costs in this era of global warming; the rise of carbon emission, the melting of the ice caps, etc. On the basis of capitalism the world cannot absorb the present growth rates if one takes China and India alone. China might be the scene of spectacular economic fireworks but it is also, with the US, one of the greatest polluters on the planet. The world, never mind China, cannot sustain a resurgent capitalism which would drag the planet further into the abyss of irreversible environmental degradation. Moreover, neo-liberalism, without which there would be no capitalist globalisation (deregulation, open borders for capital) as such, is a policy that world capitalism has no choice, at this stage, but to seek to implement throughout the globe. This inevitably has and will, in the future, provoke a ferocious resistance, including revolutionary outbursts, from the working class and the poor masses. Even during the period when capitalism was ‘relatively progressive’ in the nineteenth and early twentieth centuries, the tendency, as Marx always pointed out, was to lower the share of the working class in order to boost the profitability of big business. This provoked the uprisings of the low-paid unskilled in Britain in the latter part of the nineteenth century, contributed to the 1905 Russian Revolution, the rise of the labour movement in the US and Europe. However, unlike the pre-1914 phase of capitalism, this resistance today has been muted or weakened by the absence of the subjective factor, a mass party of the working class able to act as a pole of attraction. The ruling class has been assisted in its ability to weaken workers resistance by the ideological offensive it conducted and the application of neo-liberalism etc. Nevertheless, mass opposition has stayed the hand, albeit temporarily, of the some of the European ruling classes. The problems confronting world capitalism are presently monumental, are accumulating and in the long term are intractable. The implications of the rise of China and the effects of this on world capitalism are major issues for Europe as much as for the rest of the world. The full implications of this have not yet fully worked themselves out. China is now the manufacturing hub of the world; each week we hear the ‘sucking sound’ of jobs disappearing from the advanced industrial countries to China and Eastern Europe. The process appears to be relentless and unstoppable. China, and to a lesser extent India (mainly through the expansion of information technology in the case of India), have developed as regions of low-skilled, low-wage manufacturing. China assembles imports from Asia and then re-exports them. Now, however, a domestic concentration on innovative, hi-tech production is under way. While a high proportion of FDI in China comes from the US, Asian capitalism has also relocated a major part of its industries to China. Taiwan, for instance, has transferred practically its whole manufacturing base to the mainland. Japan has acted likewise. This has led to the situation highlighted in a recent EU report, which warned: “China is emerging as the most competitive manufacturing platform ever.” Almost 20% of China’s exports are already classified as hi-tech and, as this report points out, “with two million graduates each year there is every reason to believe this percentage will grow”. The share of Chinese GDP devoted to research and development is growing by 10% annually, while in the EU it is rising by only 0.02%! (Of course at this stage the EU is starting from a higher level). Up to recently, bourgeois economists could comfort themselves with the notion that while manufacturing production could be relocated to China and elsewhere, research and development facilities, and thereby a monopoly over technique and technology, would still be concentrated in the ‘home’ country. For instance Dyson, the British vacuum cleaner manufacturer, relocated its production facilities to Asia while maintaining research and development in England. But the rise of China’s hi-tech base, partly facilitated by borrowing and outright ‘stealing’ from the advanced countries, could no longer necessarily allow this comfort zone to be maintained. This process is even resulting in a tendency towards the ‘hollowing out’ of manufacturing industry in the USA. This is graphically demonstrated by the recent crisis at General Motors, one of the flag ships of US industry, which has announced 30,000 redundancies. Ford faces similar problems which are symptomatic of the decline of manufacturing industry in the USA. As we have explained the US economy is being relatively weakened by the emergence of Chinese imperialism. While the USA still remains the most powerful of the imperialist powers it is a relatively declining power. Should this trend of a tipping of the balance towards China at the expense of US and European imperialist powers continue (and there are many factors which can still delay and cut across it) it will provoke social and political convulsions in the older imperialist powers. It will also enormously strengthen the Chinese proletariat in numbers and social weight. Its political consciousness at this stage is however at a low level. The implications of this massive relocation of industry and jobs to China and elsewhere raise some important issues with regards to Marxist theory. Marx, and before him Adam Smith, differentiated between ‘productive’ and ‘non-productive’ labour. The former created new value, in modern parlance ‘added value’. Non-productive labour, although often vital to the workings of capitalism, does not create new value but shares in the profits, wages, income, etc, which ultimately come out of the value created by productive labour. Marx pointed out that the surplus value created by the labour of the working class is divided into rent, interest and profit. It is not just in manufacturing that new value is created in the production process. But productive industry, manufacturing and its spin-offs, are the main source of value. Therefore, to lose a manufacturing base and all the attendant spin-offs and industries connected with this means, at best, becoming dependent on more powerful industrial countries. Some can carve out a position for themselves as a ‘rentier’ capitalist country, specialising in ‘services’ such as banking, tourism, etc. This can be bolstered, as is the case in Britain for instance, by an income arising from big foreign investment, including the super-exploitation of the masses in the neo-colonial world. At the same time it can be a recipient of sizeable FDI, as has also been the case in Britain up to now. This is in the short term and will not necessarily be so in the future. However, for an economy, even continents, this situation poses the danger of a shrinking industrial base and a reliance on ‘services’. This, in the words of former British Prime Minister Harold Macmillan, is like “taking in other people’s washing”. In the long run, the loss of real economic strength will be revealed in other fields. Industrial strength ultimately reflects diplomatic ‘soft power’, and at a certain stage also military prowess, the potential for ‘hard power’. The prospect of China accumulating this economic and military power presently excites the opposition of the US ruling class. The ballooning bilateral trade surplus of China in its trade with the US has provoked clashes on textiles, shoes etc. This is likely, at a certain stage, to generate an uncontrollable protectionist backlash as well. This is also linked to the growling of the US at China’s continued building up of military power, which in turn is linked to the rapacious search for more and more resources to fuel its economic growth. This in turn brings it slap up against the US ruling class, which is also involved in this ‘Great Game’, particularly for oil. In Asia there is the clear emergence of a Chinese led block in opposition to Japanese imperialism which is in alliance with the USA. This conflict has already resulted in a strengthening of Japanese nationalism. The effects of these inter-imperialist rivalries have also led to China increasingly collaborating with Putin’s Russia ironically to a greater extent than both the former Stalinist states did. Add to this the stalling of the Doha and W.T.O. round of world trade talks – including a clash within the European bloc over agriculture, enlargement along with other issues – and it does not take much to imagine a future of increased rivalry and clashes which can be enormously aggravated by a world economic recession or even a stalling of growth. Although in absolute terms world trade has expanded, the world economy within its recovery phase from 2001 has been experiencing a ‘growth recession’, a small development of the productive forces while failing to solve endemic unemployment, particularly in Europe where the official jobless figure stands at over 20 million. In the recent period the ruling class in the USA and some other countries have implemented a ‘Keynesianism for the rich’ by giving tax cuts to the wealthy. Bush has given tax cuts of US$700 million to the super wealthy in the USA. These tax cuts have had virtually no effect on boosting consumer spending. Following the hurricane Katrina catastrophe he was compelled to announce a rebuilding programme. At the same time he claimed he will reduce the federal deficit by 50% by the time he leaves office. These cuts will be centred on slashing Medicare, welfare, housing and other programmes. In other words the poor will pay for these cuts. The eating away of the reserves of capitalism will raise the prospect, in a deep recession, of the ruling class turning once again to the ‘printing press’ and run the risk of unleashing inflationary pressures. As in the 1970’s they could be faced with stagflation if they resort to such measures. While the current ‘growth recession’ continues, the capitalists can hang together, occasionally striking blows at each other but without a complete fragmentation into a serious trade war. But a recession and even a period of slower growth will result in clashes which in turn can enormously aggravate the problems of the world economy. The fundamental factor – not immediately and not directly of course, but ultimately – is the development of the productive forces as the main motive force in shaping consciousness, particularly of the working class, and the reflection of this on political events. What is striking about the present world situation is that the bourgeoisie is confronted by an unprecedented crisis of confidence worldwide. It is particularly pronounced in the USA and Europe. The catastrophe in Iraq, combined with economic and social developments, has been a major contributing factor in this process in the USA, Britain and Australia. The defeat of the EU Constitution in France and the Netherlands had a similar effect and demoralised the ruling classes in these and other EU countries. This loss of confidence is before the serious onset of economic problems for them in the form of a recession or slump. It is sharply manifested within the major capitalist imperialist power, the US itself. The neo-conservative cabal which rules through George Bush’s presidency has been an unmitigated disaster for US capitalism. Their rule has some parallels, only on a much larger canvas, as that of Thatcher in Britain, 20 years ago. Her ‘legacy’ is one of a fractured and increasingly impoverished society hidden by the glitz of economic ‘progress’. This has condemned her Tory successors to ignominy and defeat in one election after another. The Bush presidency threatens to do the same for the Republican Party, because of the disastrous, un-winnable war in Iraq but also in its economic stewardship of the US. The Bush presidency is now in ‘free fall’. Not only is it engulfed in the Iraq debacle, but was disastrously damaged by the social and class repercussions of Katrina. Now it faces corruption scandals which threaten to go right up to Cheney and have already involved leading Republicans. The current scandal has already involved Congressmen Robert Ney, known as the ‘Mayor of Capitol hill’ and Tom DeLay, known as ‘the hammer’ because of his role in enforcing Republican discipline in congress. A section of the US ruling class is now trying to ‘clip the wings’ of the Bush regime. Corruption is endemic in the capitalist world and amongst the ruling class internationally. This partly reflects a change in the make up of the ruling class which internationally has become more and more parasitic and also the absence of mass workers’ parties which partially checked some of the ‘excesses’ of capitalism in the past. While the first term of the Bush administration was marked by the attempts of the neo-cons to assert the power of US imperialism. The second has been a clear demonstration of the limits of that power. As we predicted in the last World Congress documents. This is not only evident in the Iraq war but was recently shown in Argentina at the Summit of the Americas where Bush’s attempts to re-start FTAA were thrown out by Argentina, Venezuela, Brazil, Paraguay and Uruguay – the ‘five dragons’. The Iraq war, like Vietnam, has convulsed US society even though the scale of American dead in Iraq is as yet merely one thirtieth of that in Vietnam. However Iraq intersects, also like Vietnam, with serious economic problems. This has bourgeois commentators bemoaning the fact that ‘nobody has the will or the notion’ of how to avoid economic meltdown. The lame duck and politically battered George Bush cannot avert the looming catastrophe. Even worse, some argue, is the fact that the US is so bereft of bourgeois strategists that in the event of a serious economic crisis, they have no-one of the ‘stature of Franklin D Roosevelt’ who could step forward and ‘steer the US in a different direction’. Roosevelt, it is argued, through his New Deal ‘saved’ US capitalism at that time. But his programme was largely, as Trotsky pointed out, advertised but limited ‘social reforms’ which did not solve the underlying economic crisis which lasted in the US throughout the 1930s. Only the looming Second World War and the development of war production began to drag the US out of the most serious economic crisis in its history. That route, a new ‘Third world War’ does not exist for capitalism. Roosevelt did play a crucial role through quasi-Keynesian methods in appearing to move the US in a different direction and politically his minimal job creation measures did pacify a section of the US working class, encouraging a belief in a ‘brighter future’. The US is beset by a huge crisis of leadership, a serious economic crisis, as well as an emergence of class feelings, which adds up to a future of political convulsions for the US and, thereby, for the world. The defeat of Schwarzenegger in the referendums in California is only the tip of the ice-burg of the social and class movements which are being prepared in the USA. The split which has taken place in the AFL-CIO, although it is not clear how this will develop, is a reflection of the dissatisfaction which exists with the conservative officialdom of the U.S. trade unions. There is the prospect of an intersection of a growing anti-war movement with a growing social and class movement on economic issues. The attacks being prepared for the US working class are shown at the Delphi car part factories which has filed a ‘Chapter 11 bankruptcy’. This company employs 56,000 workers in the USA and 129,000 outside. They are demanding a pay cut in the US from US$27 per hour to US$9.50 per hour plus cuts in medical benefits. Such attacks are going to lead to powerful struggles by the US working class in the coming period. The emergence of a growing class movement in the USA will be one of the most significant developments in the next period which will have important international repercussions. The anti-war mood and catastrophe in Iraq has now driven a section of the Democrats to rediscover their ‘conscience’ and they have belatedly started to oppose the war. The Democrat Congressman John Murtha from Pennsylvania and who significantly served in the marines for 37 years has now called for the immediate withdrawal of US troops from Iraq. With close links to the military he was probably speaking for a wing of the US marine corp. At the same time Hillary Clinton, a strong contender for the next Presidency, continues to back the war which her husband has described as a “big mistake”. The depth of the crisis in the USA has been reflected by the unprecedented public criticism of the current White House by two former Democratic Presidents, Bill Clinton and Jimmy Carter as well as sections of the Republican leadership like Brent Scowcroft. These growing social antagonisms in US society are in the process of undermining both the Republican and Democratic Parties as far the masses are concerned as the ground is prepared for a new mass party. The growing crisis in Iraq and the growing anti-war mood at home has raised the issue of a US withdrawal. The Iraqi government has now spoken in terms of this being possible in twelve months time. A full withdrawal will not be possible because of the deepening crisis in Iraq. However, a “scaling down” to an occupation force of about 100,000, concentrated on key bases and strategic areas is a possibility. Without a unified, non-sectarian workers’ movement a full scale withdrawal would result in an even greater sectarian and ethnic conflict. On the basis of capitalism there is no prospect of a stable bourgeois democracy being established. Growing ethnic and sectarian conflict can result in the break up of Iraq into three ‘states’ raising the prospects of Saddam Hussein’s regime being replaced by three reactionary repressive regimes – governed by three ‘mini Saddams’. The imperialist forces face an insoluble problem from their point of view. The price for this is paid by the Iraqi peoples and those of the whole region. The crisis in Iraq clearly shows the limitations on the ability of US imperialism to directly intervene elsewhere. US imperialism clearly still wants a regime change in Iran and Syria but is unable to undertake another military adventure. Even the bombing of Iran, while not ruled out, is unlikely. The policy of Bush has driven the reactionary theocratic regime of Ahamadinejad in an even more hard line direction. However, the repressive nature of his regime is provoking widespread opposition to it in Iran and it has already over-reached itself. As in Syria the US is hoping for a version of a new ‘Orange revolution’ to remove these regimes and install more pro-US governments. At the same time events in Israel and Palestine have opened a new phase in the crisis. The election of Peretz to the leadership of the Labour Party reflects, in a distorted way, the massive class and social divide which are opening up in Israeli society. This very significant development has now been partly trumped by Sharon splitting from Likud and forming a new party. Behind this lies the death of the Oslo peace process, the end of the second intifada and the acceptance by a section of the Israeli ruling class and currently Sharon, of the US road map. This amounts to accepting that Israel will re-draw its borders behind the newly constructed ‘security wall’ which will be more ‘defendable’. This will mean giving up some limited territory – although not the crucial areas or settlements. It will not be a redrawing of borders to pre-1967. The cowardly Palestinian ruling class, through Palestinian Authority, has welcomed these developments. Yet, despite the withdrawal from Gaza, they do not represent a victory for the Palestinian people and will not resolve the national conflict in this crucial area. The crisis in the whole region will be aggravated by the ongoing nightmare of the Iraqi conflict and the explosive situation which is unfolding in Iran, Saudi Arabia and other countries. These developments underline the disaster that US foreign policy and the ruling classes of the region mean for the peoples of the Middle East. We must look to the underlying class conflicts which are developing in the region which will prepare the basis for a new phase where socialist and revolutionary ideas will grow, presaged by the recent strikes that have taken place in Qatar, United Arab Emirates and Kuwait. The defeat of the EU constitution in France and the Netherlands had a devastating effect on the European ruling classes. It demoralised them and undermined their political confidence. The process of European integration has been stalled. At the same time increased tensions and conflicts have emerged between the EU states. One reflection of this is the clash between Britain and France over the CAP and between all the EU countries and Britain over its’ rebate. In general the European economies are stagnant and have suffered a small increase in inflation. The fear of inflation initially led to a debate about the E.C.B. raising interest rates. They then stepped back from this policy only to then decide to raise them in December. The policy will only aggravate Europe’s economic stagnation. The new EU countries from Eastern Europe have not caught up with the western European countries. Any economic growth which has taken place in some countries has been based on cheap labour. There has been a massive social polarisation which has opened up. A feature of these countries is the absence of stability in any of the governments. The social tensions which have arisen in Poland point to the prospect of social upheavals. The process of EU expansion has resulted in greater instability and tensions within the EU. The developing crisis in Europe is particularly reflected at this stage in Germany, France, Italy and Portugal. Developments in these countries and the current strike movement in Belgium are an indication of how elements of these processes will unfold in the next period throughout Europe. The German elections, with the defeat of Schröder – if not yet his whole neo-liberal programme – represented a setback for the plans of the ruling class. The emergence of the WASG was a crucial factor in this process. The coalition government of the CDU and SPD coming out of the election is a weak one that will be paralysed by splits and indecision. Moreover, it will give the opportunity for a more potent force to develop out of the process of the formation of a new left force consisting of the WASG, the Left Party/PDS and other forces and activists. This could be accompanied by industrial action in opposition to factory relocations, wage cuts and the intensification of anti-working class measures by the new Grand Coaltion government. There is even a dim recognition by some bourgeois commentators that the neo-liberal offensive in Germany cannot be carried through, at this stage, in the way that they hoped and intended. Before the election, the bourgeoisie looked towards a CDU-led coalition to go further than Schröder, who was meeting with internal opposition to his neo-liberal measures from within his own party and the unions. They expected a clear victory for a CDU-led government which would confront the German working class. The election outcome signified a defeat for this perspective. The weakness of the government and potential for the onset of a rapid crisis was even reflected in the vote to elect Merkel as Chancellor. 51 MPs from the governing coalition voted against her! Even within her own CDU she has faced opposition with important state leaders refusing to serve as government ministers. During the election campaign Merkel promised to cut income tax and raise VAT One of her first announcements in office was to raise VAT by three points as an attempt to reduce the 35 billion euro deficit. German imperialism has paid a heavy price for the ‘success of unification’ politically and economically. Eastern Germany has swallowed up 1,300 billion euros in subsidies since 1991 only to see unemployment remain at 18.4%. The policies of tax increases will not help stimulate growth in Germany where consumer spending is low. It will strengthen recessionary tendencies. The Schröder government, through the trade union leaders, was able to prevent a widespread generalised industrial movement against Agenda 2010. It will be much harder for this weak coalition government, of the “losers” (all the parties in the coalition lost support) to be able to hold the working class in check. Already there is anger at the attacks on civil servants and there has been an outbreak of some localised strikes of a defensive character. These indicate that the coming to power of this coalition will open a new phase in the crisis in Germany which could see a more generalised movement against the neo-liberal measures of the government. The neo-liberal attacks on the working class have also provoked a period of upheaval in France, Spain, Italy, Germany, Belgium and Portugal; in fact, a continental revolt is brewing. The first instinct of the bourgeoisie when faced with social upheaval is to bend to the wind. Some of their strategists have argued that in Germany the kind of frontal attack launched by Schröder and promised by Merkel could ignite social upheavals and therefore they urge caution. Better to attack from ‘below’ industry by industry, or even factory by factory, rather than through an overall national offensive at this stage. There is a concerted attempt to break the system of national negotiations between the employers and the unions. In France, deVillepin reacted to the successful general strike in October with the declaration that he was “listening”. None of this means that the bourgeois will easily abandon their neo-liberal policies but mass resistance can compel a temporary retreat, as was partially the case in the pensions struggle in Britain, and elsewhere. Moreover, if the world economy implodes the economic consequences could be so grave that the bourgeois could put on the shelf, at least temporarily, these policies in favour of greater state intervention and further ‘priming the pump’ of increased state spending even at the cost of a growth of inflation. In fact, a phase where this becomes the dominant trend amongst the ruling classes is inevitable at some future stage. But as indicated earlier the scope for classical Keynesian methods is limited and can only be implemented at the cost of inflation. The outbreak of mass rioting in France was in response to the neo-liberal policies of Chirac/deVillepin and the desperate social conditions which exist in the ghettoes which surround most French cities. They reflect the intense social and class contradictions which exist as well as the vicious racism of the French state. This social upheaval was not a “racial or ethnic” movement as the French right have argued. It was an explosion of anger by the poorest and most downtrodden sections of society – including a layer of poor whites. It was an inchoate movement by those with no political channel through which to express their anger and rage. Such an outburst of anger is the responsibility of French capitalism, the ruling class and the Socialist and Communist parties who have effectively abandoned the working class and the youth. It is also a condemnation of the LCR (for opportunist reasons) and the LO (for sectarian reasons) which failed to build a political alternative that could channel the anger and bitterness felt by the youth involved in the rioting. The French government has nevertheless presented these events as racist and have used them to whip up racist sentiment. They have implemented vicious repression including the introduction of a State of Emergency (the first for a prolonged period since 1961) and the use of curfews. This has been applied on a selective basis in 30 districts. It has involved the use of the CRS (riot police), police on the streets, helicopters and curfews. Over three thousand – including the parents of youth involved in the rioting – have been arrested. The use of such measures reflects the semi-Bonapartist characteristics of the French state machine. At the same time increasingly repressive and anti-democratic methods are also being adopted by the state in Britain, USA, Australia and other countries. So far Britain, Ireland and Sweden have in effect operated an ‘open door’ policy on immigration. This has been done with the objective of bringing in workers from other countries and using them as cheap labour as a means of forcing down wages. The bitter struggles of workers in Ireland and Corsica involving ferry companies show the importance this question will assume in the next period of time. Across the EU, the policy of using immigrant workers as a means of forcing down wage rates and conditions is now going to be applied in a more generalised way. The dramatic effects of these changes can mean that in many countries the issues of immigration and racism can become a central issue. It can raise fears by workers in those countries affected by this policy and be used by the far right as a means of whipping up racist sentiments and feelings. In some countries the far right has suffered some electoral set backs, for example in Austria. Significantly, in the recent general election in Germany the emergence of the WASG/PDS prevented the far-right making gains. This does not mean that the threat has been removed. The danger of the far right making some future electoral gains can be posed, especially during a worsening economic situation, by playing on the fears of workers and by whipping up racist sentiments and feelings, especially if not powerful left or socialist alternative exists. We need to be prepared to take up the question of racism and in particular it will need to be a central aspect of our youth work and activity by our sections in those countries where it is relevant. It will be necessary for our campaigning work to take up two main themes to answer racist ideas. One the one side a campaign in the labour movement to win migrant workers into the trade unions and workers’ organisations and to fight for them to receive the established wages and conditions. On the other hand it must include a campaign against racism and reactionary nationalism and ethnic prejudices. The nature of the outburst of anger in France has allowed the government at this stage to win increased support for repressive measures. However, it is not Chirac who has gained from this but de Villepin and Sarkozy. Although workers and youth understand the cause of the rioting lay in the social conditions and racialism of the state according to a CSA poll, 68% support the extending of the state of emergency. The same poll even 75% of those who voted for the LCR/LO all supported the State of emergency. However, such moods are a temporary response to this crisis and can rapidly change, especially in France, as the government tries to push ahead with its neo-liberal policies. The PSF, has tilted to the ‘left’ in response to the current crisis. However, it remains a bourgeois party and offers no alternative for the working class. 69% think the PSF cannot win the next election and a similar number think it would have carried out the same policies as the government if it were in office. The experience of the last Socialist government still remains in the consciousness of the masses. These developments in Germany and France are central to the situation unfolding in Europe. At the same time other countries have entered a period of crisis and social turmoil. Italy is the sick man of Europe both economically and politically. The Berlusconi government is embroiled in one crisis after another and has now attempted to save itself by simply changing the rules for the elections due next April to try and remain in office. Despite these changes opinion polls indicate that there is still the strong possibility that the opposition ‘Union’ centre-left alliance will win these elections. It is not ruled out that, using the desperate anti-Berlusconi mood as a justification, some PRC leaders could go beyond supporting the centre-left election alliance and join a possible centre-left government. If they take such a step we would need to oppose. Such a development would at a certain stage provoke a new crisis in the PRC as a centre-left government came into collision with the working class and youth. Portugal, with a desperate economic situation, is undoubtedly on the eve of a social explosion. Together with the strike wave in Belgium and the opposition that is developing to the Blair government in Britain, these events point to a more explosive and favourable situation developing in Europe to build and strengthen our sections. 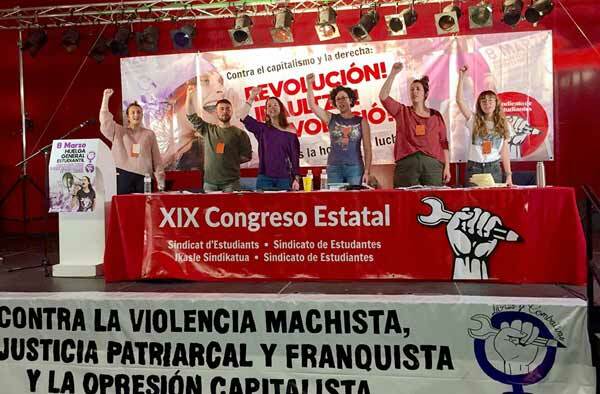 In Europe and internationally it is clear that a new more favourable period of increased difficulties for capitalism and a growing mood of resistance by the working-class has now begun to open up. The next period will inevitably include many contradictory features resulting in steps forward being taken by the working class in the form of struggle, organisation and political consciousness together with other complications and setbacks. However, new and greater opportunities are presenting themselves which will enable our sections to take important steps forward, strengthen our influence and build the membership of many sections. This will require our sections to sharpen our interventions and take bold initiatives. We will be able to make a major impact in the class struggles which are now beginning to unfold if we intervene correctly. This is shown by the tremendous intervention Joe Higgins and the comrades in Ireland have made in the current struggle at Irish ferries. It is especially important that we are able to intervene by not only explaining our general programme and methods. We will be able to make a big impact in workers’ struggles if we are able to make correct specific proposals about how to organise and conduct the struggles which take place. When making interventions in industrial and other movements our sections need to ensure that our tactics and proposals are fully discussed and assessed in the sections at each level. The next period will give us far greater opportunities to build our sections than have existed during the last decade or so. We need to be ready for rapid changes and leaps in political consciousness and ready to take the necessary steps to intervene when such changes take place. The CWI does not adopt one universal tactic in each country without taking into account the specific conditions which exist. But in many countries the question of the need for new mass workers’ parties is emerging as a crucial issue. It is essential that our sections repeatedly assesses and reassess the tactics and tasks we need to adopt in dealing with this important issue. The turn towards the WASG. in Germany and P-SOL in Brazil have already yielded important gains for these sections. The initiatives we are taking in Britain and Belgium to launch major campaigns on building new workers’ parties show the initiatives we need to be ready to take when applicable. Above all it is necessary for all our sections to give special attention to recruiting and then politically developing a new generation of comrades. The stepping up of our youth work and our interventions amongst the working class need to be the main priorities for our sections. We need to take special measures to politically integrate and develop the new generation of recruits. This must be the most important priority in the work and activity of all sections and members in the next period. The next period will give us much more favourable opportunities to strengthen our sections and to put the CWI on the map.